Conner Green seeks to investigate the social ramifications of monumental architecture through collages of found materials, drawings, and photographs. “I understand ‘architecture’ to refer to more than just the design and decoration of buildings, but also to how thought or action can make order and meaning out of random space,” Green says. 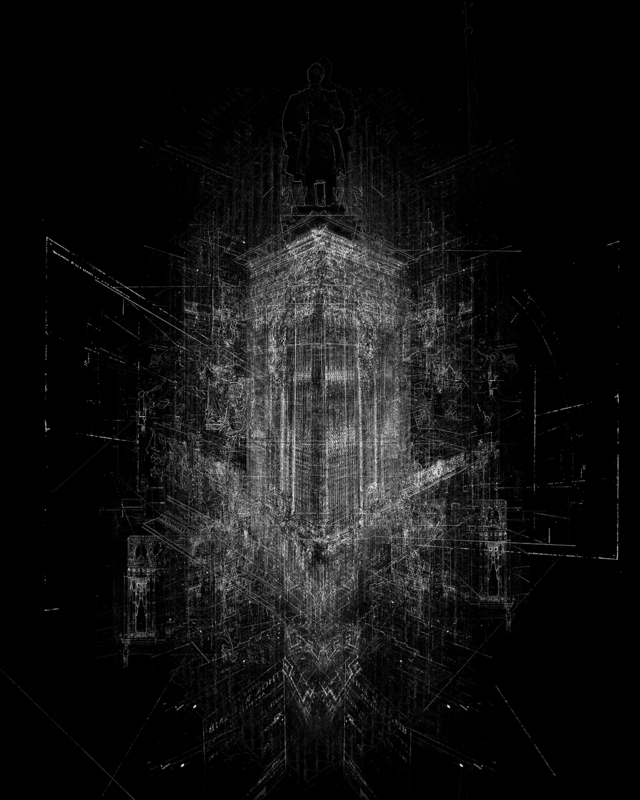 “My work, in part, attempts to excavate those embedded meanings.” To create his work, Green digitally assembles his materials into sketchy, black inkjet prints that resemble schematic drawings or computer renderings, producing a sense of disorder in the otherwise highly organized and rigid, even scientific, discourse of architecture. The rendered forms do not refer to any extant structures, rather they attempt to portray a kind of typological composite of different built forms throughout history.